Stephanie gave a presentation to Energy UK (trade organisation of the energy suppliers) about CO-Gas Safety, unintentional deaths & injuries from CO, what needs to be done to prevent these and what CO-Gas Safety is asking Energy UK for. All of the big 6 were represented by board level communication directors. Stephanie was kindly supported by Frank Brehany of Holiday Travel Watch. This was the first time CO-Gas Safety had been allowed to make a presentation to the representatives of Energy UK. The huge need for prime time TV warnings about CO which CO-Gas Safety had pointed out in 1995 and ever since . The Corfu tragedy was also discussed along with the fact that the tour companies and ABTA had ignored many meetings with Consumer Safety International and CO-Gas Safety asking them to improve holiday safety as well as an article published in the Times in 1999, written by Stephanie Trotter suggesting an organisation to improve holiday safety (similar to the Advertising Standards’ Authority) or failing this, the setting up of an ‘Ofhol’. Stephanie Trotter and John O’Leary had a meeting with the Gas Distribution Networks (Scotia Gas Networks, Northern Gas Networks, National Grid ad Wales & West Utilities) to discuss the CO Awareness competition. A member of the Guild of Master Sweeps, Gary Atkins from Ipswich has fallen off a roof while fitting a cowl for a customer and may not walk again. Please help if you can. Dean Baker, read our advert in the Registered Gas Engineer asking for the help of registered installers to raise awareness of gas safety and our CO Awareness competition for primary school children kindly sponsored by the Gas Distribution Networks. 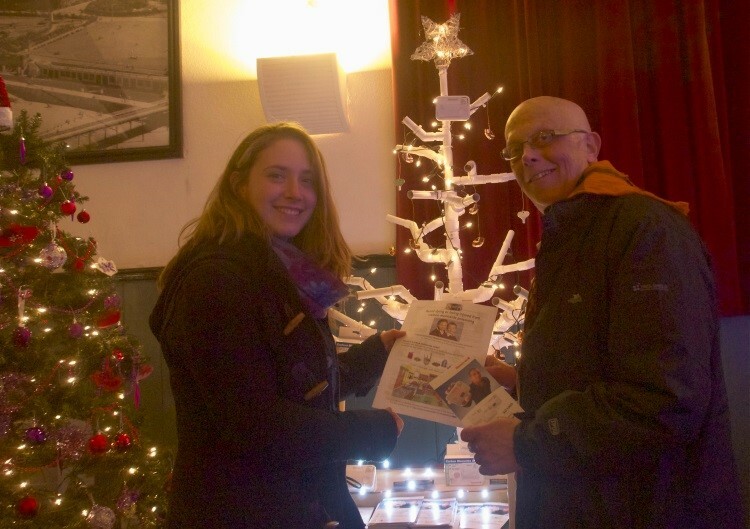 Dean kindly held a local event on the 12th December to hand out flyers for our competition, leaflets including our leaflet about CO and made a Christmas tree out of pipes decorated with CO alarms to EN 50291 kindly donated by Honeywell. Dean Baker is on the right and Fiona Joyce on the left. An interesting day. Zane, aged 7, died in February 2014 in Chertsey, Surrey. The cause of death is alleged to have been carbon monoxide poisoning but the family are convinced it was hydrogen cyanide. Today it was said that 25,000 parts per million of hydrogen cyanide were found at the time. New documents have recently been disclosed by the Environment Agency. The inquest is due to be started on the 18th January 2016. We recommended the QC Leslie Thomas who was there today representing the family with great determination and skill. All the family wants is the truth for Zane. An amazingly inspiring day. I was honoured to be asked to share it. £41,525 has been given in charitable donations by training and certification provider, BPEC, to projects that use plumbing skills to enhance the lives others less fortunate either here in the UK or abroad. At its fourth Life Award presentation ceremony held at Derbyshire County Cricket Club, on Friday 16th October and attended by over 100 representatives of the Plumbing Industry, The BPEC Charity made three major awards to deserving projects. In addition three other projects were supported via the BPEC ‘Legacy Fund’ that was launched last year. The legacy fund ensures projects supported by BPEC are sustainable over a longer period. The BPEC Charity were also delighted to welcome Dean Buchanan as their guest speaker at the event. Dean is from Datum Foundation and he provided a wonderful insight into the progress being made on the new build school construction project in Malawi. The project was awarded the BPEC 2014 Life Award. The BPEC Charity Life Award 2015 was presented to Emily Gait and Stephanie Moore from Pump Aid. The project being delivered is to build 10 new Elephant pumps across 10 communities in rural Malawi. Emily & Stephanie received an award of £15,000 from The BPEC Charity. This award will help provide clean and safe drinking water for over 1,000 people. The funding will also assist in the delivery of health and maintenance training and help establish water point committees within the local communities. The BPEC Charity also awarded £9,100 to Shane Trevitt to fund the ‘Township plumber trainer programme’ in Johannesburg, South Africa. This project will deliver a series of water and sanitation upgrades and start to train local people living in the township basic plumbing and maintenance skills. £8,550 was presented earlier in the year to the ‘Friends of Sawbridgeworth Neurological centres’ to purchase two highly specialised shower chairs. The new shower chairs have already had a huge positive impact to the 120 residents, providing a comfortable and dignified means of using the bathroom facilities. Professor Sheila Henderson and Celine Austin attended the event on behalf of the Friends group. BPEC Chairman Frank Glover said: “2015 has been another brilliant Life Award event; the panel of Trustees have been truly inspired by the submissions that have been received this year”. Frank Glover went on to say: “The Life Award continues to have an inspirational effect on everyone connected with the projects and is changing perspectives and attitudes in a really positive way. The experience the Plumbers gain by being involved in the projects is immeasurable and helps to develop their skills to operate in today’s competitive marketplace”. The BPEC Life Award is gathering momentum and is a true force for good in today’s society and the search has now started for applicants for the 2016 BPEC Charity Life Award. Everyone who works in or is connected to the UK Plumbing sector is encouraged to make a submission for consideration by the panel. The closing date for applications for the 2016 BPEC Life Award is 30th June 2016. BPEC (Training) Ltd otherwise known as the BPEC Charity is a registered charity committed to identifying the education and training needs of those who work in the Plumbing industry and providing innovative solutions to address their needs. The Life Award was launched in 2012, in memory of BPEC’s founding Chairman Raymond J Brooks, to reward and support those in the UK plumbing industry who use plumbing skills to enhance life. There are two other opportunities for financial support from the BPEC Charity that’s open to everyone working in the UK plumbing industry; these are the Support Fund and the Sport Awards. For photos please contact India Ward.